This is a common method of attaching a pulley to a shaft on a rotary motor. Stepper motors or servo motors are often used for positioning, but for applications such as conveyors or similar AC motors (asynchronous motors) or brushless DC motors are often used. There are numerous different gear profiles in different sizes and for different applications (see some examples at Aratron). The belts are also available in different materials, mainly rubber or polyurethane reinforced with some type of cord, often made of steel or kevlar. Toothed belts are often a cost-effective solution both for constant motion and for positioning, providing both high speeds and a great deal of power, but with relatively little noise. The limitation is, however, their precision. Since toothed belts are elastic (often not very elastic, but this cannot be completed avoided), it is difficult to carry out highly precise positioning with toothed belts. A lead screw is a screw attached to a motor shaft in some way, usually by welding or by means of a shaft coupling, in which the screw is turned and a nut mounted on the screw is prevented from rotating. When the screw rotates the nut moves axially. This technology provides rapid and strong movements, generally with a low sound volume. The technology also allows more precise positioning than toothed belts can provide. By increasing the pitch of the screw, a more rapid but weaker movement is obtained. Conversely, a screw with a lower pitch naturally provides a slower but stronger movement. When the pitch is low, however, you need to be aware that the efficiency will deteriorate significantly. This results in greater losses, especially since the screw is self-locking, i.e. it becomes difficult or even impossible to push or pull the screw and cause the motor to rotate. An important limitation with lead screws is the stroke. Unlike belt drives you are often limited to a relatively short stroke with lead screws, since the screw must be stored at the “far” end and a long screw can risk being bent in the middle. Lead screws are often suitable in applications where cost outweighs performance. Ball screws operate in principle like lead screws, but instead of the nut sliding on the threads of the screw, it is mounted on ball bearings. This results in significantly less friction and thus higher efficiency. This in turn means that a ball screw with a nut never becomes self-locking, regardless of pitch. Ball screws are highly precise (and are available in a rolled or ground design depending on the precision requirements), they can handle both high speeds and plenty of power and are relatively quiet. The disadvantage is that the price is higher than for either toothed belts or lead screws. Ball screws are suitable for optics (where precision is of paramount importance), in machine tools (where high efficiency, precision, high speed and high power are important) and in metrology equipment (where precision and in some cases speed are important). A motor with an integrated ball screw can be a smart solution. Belt drives are often combined with a ball screw or lead screw, usually for reasons of space. This allows the motor to be mounted parallel to the screw. Linear motors work like brushless DC motors in which the motor has been flattened out into an elongated rail. This is quite simply a long rail with a number of magnetic poles. The windings are located in the carriage moving along the rail. This is often inverted by locking the housing in place and letting the rail move instead. It depends on how long a rail is required. When the rail becomes heavier than the housing, it is often a better choice to move the carriage, but you then have to take the wiring into account. This technology, which is also used by our QuickShaft motors allows for both high speed combined with high precision and virtually silent operation. What is gained in terms of speed and precision is, however, lost in terms of power. There are, however, linear motors with really high power levels of up to several thousand Newtons. 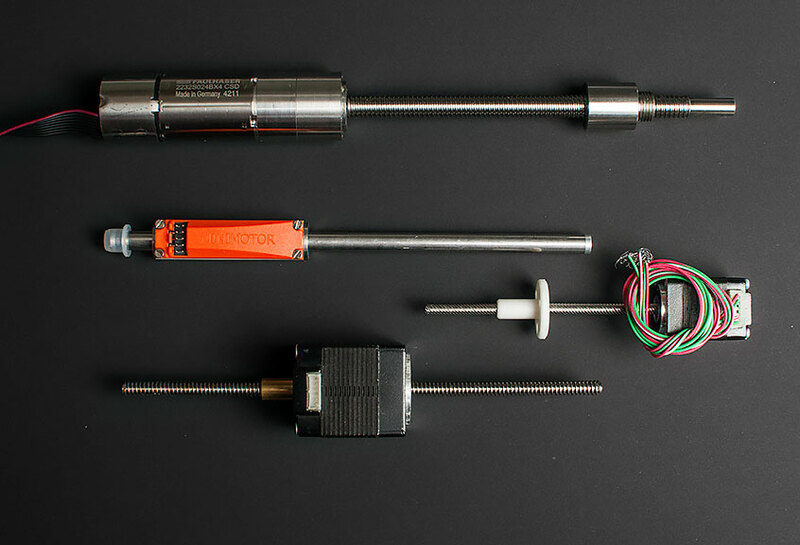 Linear motors are ideally suited to applications requiring both high speed and high precision such as pick-and-place machines. There are more options than these for creating linear motion with electric motors (for example, racks are common in some drives), but these are the most common ones we come across. What do you consider to be the advantages and disadvantages of different technologies for creating linear motion? Do you agree with this or do you have a different opinion? Write a comment! Do you want to discuss what technology for achieving linear motion is best suited to your specific application? Contact one of our sales staff and application engineers.